[Friend of the anonymous programmer who discovered the issue, Brian Young] calculated the odds of three letters of the alphabet being combined with 255 symbols, and said he found that the odds of obtaining the message were less than one in a trillion. You can’t stop the bomb. Sad people will be killed. Say goodbye. Where’s your god now? Bomb. Computers are about to revolt so let’s all buy bottled water. Lyrics to “Zombie” by The Cranberries. Even though Wingdings wasn’t correct in its prediction that time—at least as far as we know (there is a case to be made that this is, in fact, hell)—the font had more up its sleeve. Again, this one has two interpretations depending on which school of thought you ascribe to. Either it’s depicting a Jew-orchestrated 9/11, or a 9/11 specifically targeting the Jews. Both, however, are irrelevant considering the fact that there was no plane with the number Q33NY. The fact that Microsoft has had to comment on this on multiple occasions is equal parts absurd and delightful. 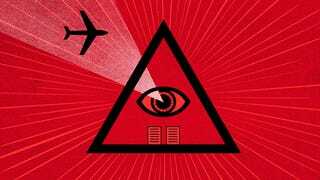 But despite everything, there is one, very real thing we can glean about Wingdings from its unfortunate online reputation: It is both the ultimate Rorschach test and a modern conspiracy-theorist’s wet, chemtrail-soaked dream. Meaning that those convoluted strings of symbols will be a truther goldmine for years to come. Quick, someone figure out what it says about Benghazi.